Bendu: "You are set on this confrontation then?" Ahsoka: "I have to know the truth." Bendu: "So be it, but understand this, much will change as a result of this encounter, including you." Ahsoka: "Isn't that true of all things, as time advances?" 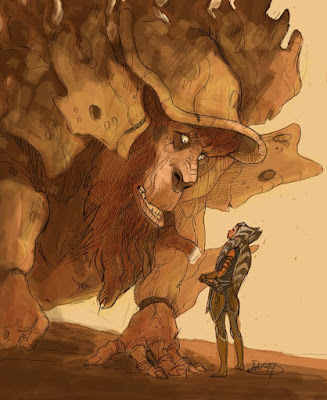 Bendu: "My dear, when I say change, I mean death." Ahsoka: "So I will die?" Bendu: "Will you? I didn't know that. Goodbye then, Ahsoka Tano, former Jedi Knight." One of the interesting aspects about this scene is that it was slated to take place at the end of Season Two, and Bendu wasn't introduced until the Season Three premiere, "Steps Into Shadow." Hopefully we'll understand what Bendu's words mean in this scene by the time the series finale airs. Filoni previously debunked a popular theory about Ahsoka's fate, namely that she was the giant white wolf we see in the Season Four trailer. Fortunately, she's not.